Opera Mini is a highly popular web browser that is available for various operating systems including Android. The initial release of the web browser dates back to 2005 and Opera has been working on it ever since. 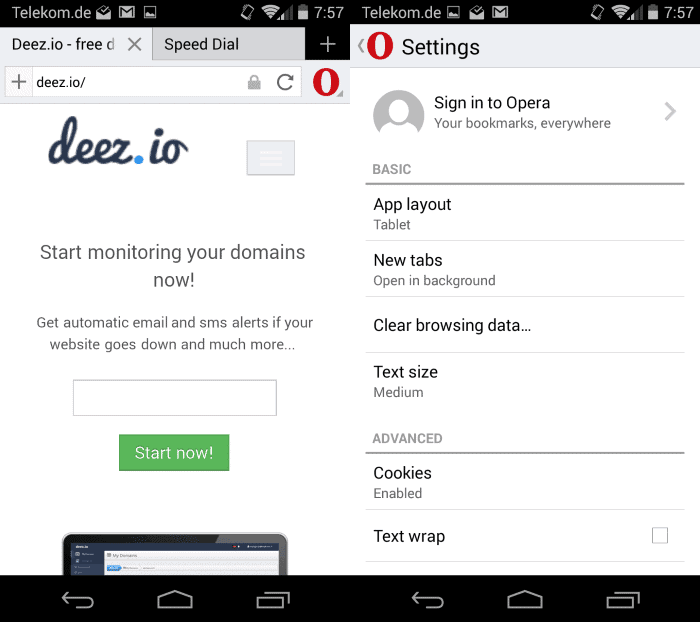 The company released a beta version of a redesigned Opera Mini browser today on Google Play. The new version is available for download for all users and requires at least Android 2.3. According to Opera, they have taken Opera for Android as a starting point and created a lightweight browser using it as the core. The beta has been released to get feedback from users which Opera wants to use to improve the new Opera Mini further. 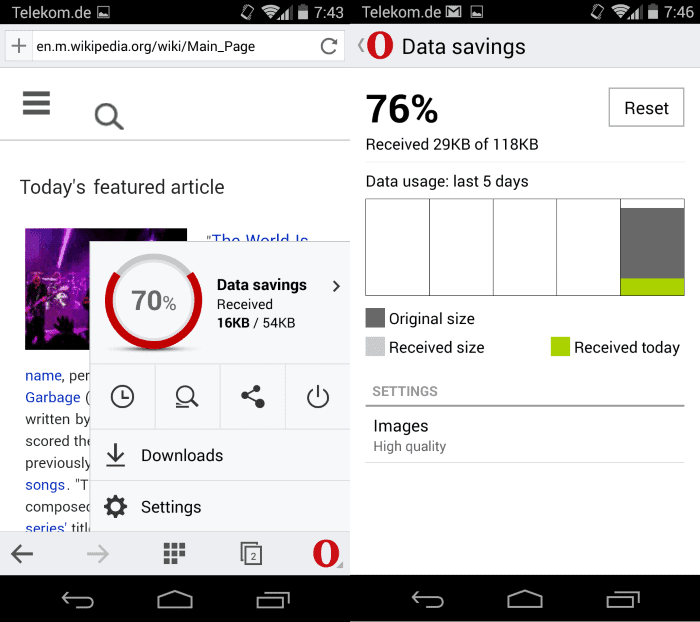 Opera Mini for Android uses the same data compression technology as the current version. This means that traffic is routed through Opera servers where it is compressed before it is transferred to the user system. The result is a size reduction of up to 90% according to Opera Software. It needs to be noted that the actual gain is usually lower than that and that it depends on the type of data that is transferred. A new feature is the ability to use private tabs in the browser. I have to admit that I could not figure out how to open private tabs in the browser. If you can figure it out let me know and I update the review asap. Update: You have to long tap on the plus icon in the interface to open a new private tab. The functionality of the browser is minimalistic. You can switch between three themes, phone, classic and tablet which change the layout significantly. The phone interface displays a single toolbar at the top, the classic interface an additional one at the bottom and the tablet interface a single toolbar but tabs in that interface as well. I do like tablet view the most as it displays multiple tabs in the interface that I can switch between easily. The app itself runs pretty fast on a Moto G 1st generation device that I used for the test. While it opened slowly on first start, it opened very quickly and was very responsive at consecutive starts. The browser supports bookmarks, the saving of pages, Speed Dial, a browsing history and several other important features of web browsers. Opera users can sign in to their account to sync data as well. Opera Mini for Android looks like a solid restart of the series. I have to admit that I'm not an existing user of Opera Mini for Android and cannot compare how the new compares to the old. One difference is that the new version supports only Android 2.3 and up while the old 1.5 and up. Now You: Opera Mini users here? If so, what is your take on the new version? Opera Software has released a redesigned version of Opera Mini for Android which is currently available as a beta version to all users. The problem with these compression services (Chrome has it too) is that websites load with ads, so although they are compressing data, the pages are still big and websites are cluttered. I’ll stick to blocking ads and using no compression. Long press on the plus sign. I seriously, seriously, SERIOUSLY hope that they haven’t replaced the Reload button with a Speed Dial button. Reload is a function I use fairly often, I really don’t need to reach all the way up to the top edge of my phone to tap a hardly visible, tiny button. Why have a dedicated speed dial button, anyway? If I want to go to my favorite site, I just create a new tab. I don’t need Opera to force me into their super awesome speed dial where I keep three entries. Opera Mini was the last sign of Presto in the company. I guess they’re finally getting rid of Presto once and for all.